This week's sketch from The Sweet Stop called for lots of layers. 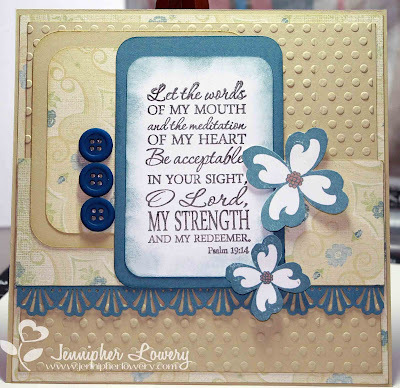 I knew that it would be perfect for another 6x6 page in the Scripture Album that I am working on. Wow, Jennipher! Your cards are cute, too. I'm following you now, also. Gorgeous card! I love this color combo. I love your card. The color combo is so pretty and I love the layers that you did nd the added touches with the punch trim and the buttons!! Very pretty!! You did a wonderful job with the colors and textures. Beautiful sentiment and a gorgeous card! It is a gorgeous card! I love the color scheme and the textures on the card. Love Love LOVE these colors together! Very nice work Jennipher. You have a nice blog that is full of creativity and inspiration.